Provide comfort for the family of Jerome Dukart with a meaningful gesture of sympathy. Dukart, Jerome J., age 86 of Chanhassen, passed away peacefully 12/14/2018. Preceded in death by his infant daughter Denise, parents John and Catherine Dukart, sister Mildred and brother Herman. Survived by loving wife Lorraine Dukart, children Lynette (Reed) Elwyn, Gayleen (Bill) Clark, James (Lisa) Dukart, Russell (Sue) Dukart, Carla Dukart and Marcy (Richard) Fergola, 14 grandchildren, 10 great grandchildren, brothers Christ, Norman and Paul Dukart. Jerome was a loving and loved husband, father, grandfather, great grandfather and overall great guy. Mass of Christian Burial 11 AM Saturday (12/29) at St. Hubert Catholic Community, 8201 Main Street, Chanhassen, with visitation starting at 10 AM. Interment St. Hubert Catholic Cemetery. 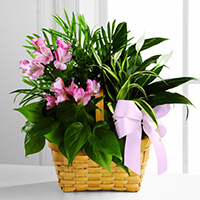 As Jerome was an avid gardener, floral tributes are requested in his honor. 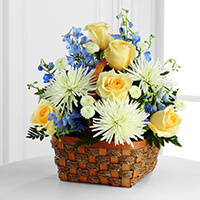 Beth and Brad Hancock purchased the The FTD Peaceful Garden Basket for the family of Jerome Dukart. Sending our deepest sympathy from North Dakota. Know that you are in our thoughts and prayers. Rest in Peace Uncle Jerome. Herman Dukart Family purchased the The FTD Living Spirit Dishgarden for the family of Jerome Dukart. Southwest Special Education and Speech Team purchased the The FTD Living Spirit Dishgarden for the family of Jerome Dukart. We are so sorry to hear of the loss of your father. Our deepest sympathy to you and your family. 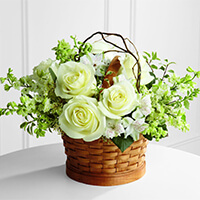 Northwestern Mutual-Edina Office purchased the The FTD Heavenly Scented Basket for the family of Jerome Dukart.